When I first started book-a-rama, it was to keep track of my reading challenges. That's the simpliest reason. After blogging for just a few weeks, I became almost obsessed! It's very addictive. I found that blogging was a great way to share my opinions of the books I've read. After reading a book, if it was something great (or awful), I've wanted to tell someone about it. Unfortunately, I have only a small group of readers in my real life. I try to share with my hubby, but his eyes glaze over like mine do when he talks about cars. That said, I also like finding readers with a love of reading and who also want to share their opinion. Whether they agree with me or not, I enjoy reading their comments. Blogging has helped me feed my creative nature. This blog has been a great forum for me to express myself, whether through writing or art. I've always had a creative streak, it's just part of who I am. Finally, blogging is a way to keep from being bored! Or just keep my mind sharp. I'm a stay-at-home Mom and sometimes Barbies aren't the most stimulating thing, you know? Sometimes it's nice to sit back with a cup of tea and type away, after the latest grocery store meltdown (mine or hers). As for tagging, I've been tagging people lately and I don't want anyone to be cranky with me. So, this is a fun meme and I encourage all my readers to do their own. Please post a comment if you do, so I can read yours. 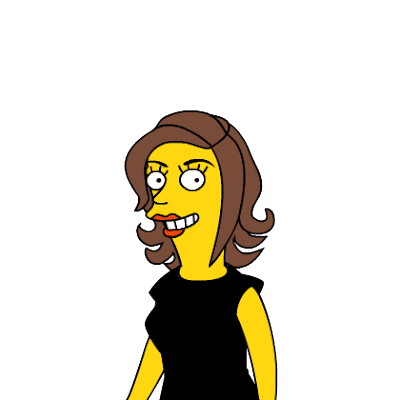 If you've ever wondered what I look like, that's me up there, Simpsonized. You can do yours too at http://simpsonizeme.com Have fun! That's a great list, and very similar to my reasons. What did stay at home moms do with their free time before the internet, I ask. I blogged for the knitters and then found the readers. How on earth did we ever get by without the net?